Looking for smarter ways to increase your business revenue? Scores of fellow Freedompreneurs have shared with me that they need help finding more ideal clients and turning potential clients into paying clients. If this sounds like you, you are certainly not alone. Over the years, I’ve noticed that many entrepreneurs, even big businesses that ought to know better, spend the majority of their time and effort on getting more clients, customers, and patients. By itself, this is not a problem; it’s actually desirable, except for the rare business where they have more business than they can handle. However, I’d like you to consider why you want and need to get more buyers: It’s to generate more sales and pile more cash into your bank account, right? That being the case, why not focus on what you ultimately want – more cash in the bank – rather than solely on getting more buyers? Along those lines, today’s blog post kicks off a mini-series in which we’ll explore strategies that go beyond simply getting more and better buyers. I call these “revenue ratchet” strategies. 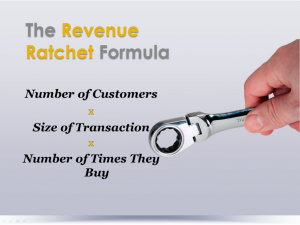 For the duration of the series, you’ll find it useful to refer to this Revenue Ratchet Formula Memory Jogger. If you tell me the number of clients and customers that you have in a given year, how much each customer buys each time they buy (the average size of each sale), and how often customers buy from you in a given year, I can predict your total revenue for the year, almost to the penny. Said differently, your revenue equals the number of buyers you have, multiplied by the average size of each purchase, multiplied by the number of times each buyer makes a purchase, for a given period. It’s very straightforward. In order to increase your revenue, you have to boost one or more of these three variables. This formula applies no matter what kind of business you have. Whether you’re a service business or you are a product-oriented business, a startup or a multimillion-dollar revenue enterprise, you can only influence revenue by changing one or more of these three variables. That’s it! 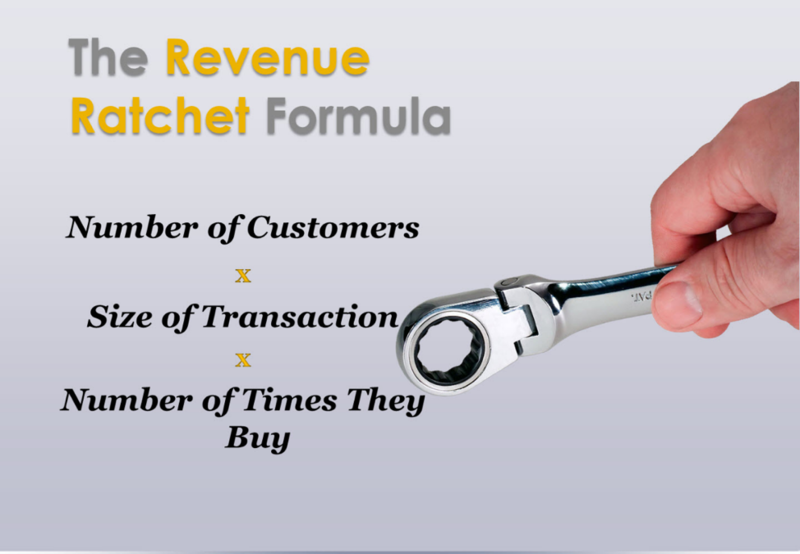 Considered collectively, the Revenue Ratchet Formula is a powerfully effective yet commonly overlooked approach to “ratcheting up your business’ revenue,” hence its name. The first strategy is to get more and better clients (and referrals); that means increasing the number of people who buy from you. The second strategy is to get them to buy more at one time; that means increasing the average purchase. The third strategy is to get them to buy more often; that means enticing buyers to keep coming back for more. In the meantime, start expanding your mindset when it comes to increasing revenue beyond simply getting more buyers. Along with your efforts to get more and better buyers and referrals, also be thinking of ways to make it worthwhile for them to buy more from you each time they buy and for them to buy more frequently.